This annual event, and its proceeds will go towards our Benevolent Fund, and the monies we dispense to the families of our fallen brothers and sisters. The Benevolent Fund cannot be maintained without our full support. We are asking for and looking forward to support of our 2019 Annual Bazaar from every Brother and Sister. 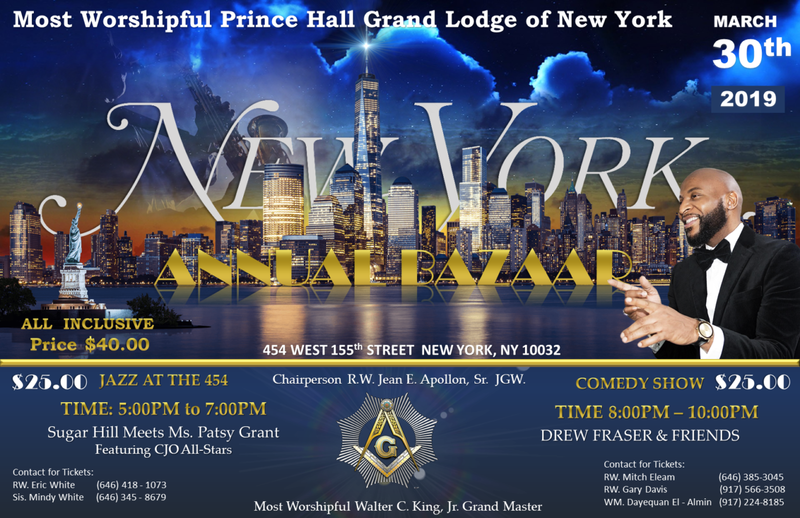 Also, Per the Directive from MW Water C. King, Jr., Grand Master, effective March 29 and March 30, 2019, all labor and activities within the State of New York are to cease for our Grand Lodge Annual Bazaar. Any requests for travel or activities during this time MUST receive approval only from The Office of The Grand Master.